As we know it has been almost 22 days since the Kickass Torrents website went down. Recently we witnessed the demise of Torrentz.eu and now it’s time for another popular torrent website Extratorrent. We noticed that Facebook is frequently removing the contents that are copyright-infringing. Now facebook is seen taking action against one of the popular torrent website name Extratorrent by completely removing its official facebook Page. As we all know, that Facebook is very active in restricting contents that are related to copyright-infringing and now Facebook has taken a step forward to curb piracy by removing ExtraTorrent Facebook fan page. Facebook had flagged the official page for Extratorrent for copyright infringement. According to the reports from Torrent freak. The Extratorrent site had stopped sharing the links that are linked to copyrighted materials on Facebook years ago. However, the page was still being reported by many copyright holders which resulted in the removal of the page. 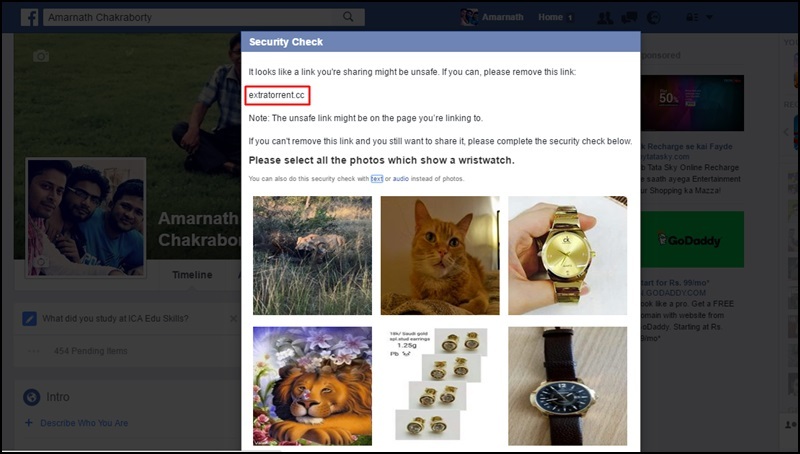 Facebook has also included a security check for users who try to share Extratorrent links on their Facebook profiles “It looks like a link you’re sharing might be unsafe. If you can, please remove this link” where users can verify the security check via text, audio or photo. So it will be worth a notice that after KickassTorrents and Torrentz.eu, Extratorrent could be the next torrent website that can come under the government’s sight.